GoXtra News: FOOD, Booze and Tattoos makes its African premiere! FOOD, Booze and Tattoos makes its African premiere! Counterculture South African travelogue and food show Food, Booze & Tattoos makes its African premiere this month. Food, Booze & Tattoos a new 12 part series from executive producer Rebecca Fuller-Campbell and producer and creator of the series Larney de Swardt will be broadcast on SABC3 on Thursday, January 21, at 21.00. The series follows presenter Brett Rogers on an epic road trip as he travels across South Africa to track down the most mouth-watering food establishments, the coolest micro-breweries and the edgiest tattoo parlours. It has already been aired to audience acclaim in a number of other countries including Sweden, Italy and Poland. Food, Booze & Tattoos showcases South Africa’s unique and diverse contemporary cultures and demonstrates that, as a tourist destination, it’s more than just a beautiful game reserve. Audiences get to follow designer, creator and Renaissance man Rogers as he searches for the best food, booze, and tattoo establishments and discovers that the three are inherently connected. Adds Rogers: “What we focussed on was food lovingly prepared, with care and with ethical concern for the sourcing of ingredients … and, of course, the food had to be delicious. I ate a whole lot of tasty things; some of my favourites were the burger I made at The Bench in George, mussels from The Leopard in Melville, buffalo mozzarella from Swellendam and the chisa nyama from Soweto’s 707 Panyaza." Rogers also picked up some new tattoos along the way: "I got six tattoos over a period of about 45 days so there was not much time to recover in between each one. But I loved getting them. I got an amazing koi fish from Dok in Durban which I’m still obsessed with. In fact, I love all my tattoos." 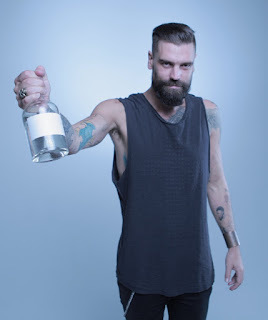 Food, Booze & Tattoos was produced by Larney de Swardt, executive produced by Rebecca Fuller Campbell, produced and created by Larney De Swardt, directed by Nic Hestor with DOP Robo Wilson. The series was edited by Lindi Goosen and Jack Esterhuizen.